Fashion designer John Varvatos is synonymous with the rock ‘n roll look, and his nearly 30 stores around the world—from San Francisco to Bangkok and beyond—attest to the global demand for his unique rebellious look. 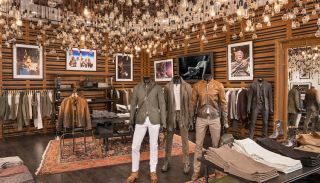 When the Varvatos company added its fifth New York City location in the Westfield World Trade Center mall, it hired Essential Communications (East Hanover, NJ) to design and install a music playback system worthy of the Varvatos name. Essential Communications relied on Ashly Audio’s four-channel nXp8004 DSP-equipped network multi-mode amplifier, paired with Ashly’s WR1.5 remote volume control and source/preset selector and Ashly’s custom iPad/iPhone remote control app. At John Varvatos WTC, Schwartz opted for a four-channel Ashly nXp8004 Protea-enabled DSP network amplifier, which delivers 800W per channel. Essential Communications also endeavored to give the new store loudspeakers to complement its rock ‘n roll memorabilia. The store had several old 1970s-era home hi-fi loudspeakers that, although non-functional and degraded from a sound perspective, still had all their visual charm. Schwartz and his team simply gutted the large cabinets and put new Community v2-8 loudspeakers inside.